By now you’ve undoubtedly heard of Snapchat, the app that that was launched in September 2011 by then Stanford University students Evan Spiegel, Bobby Murphy, and Reggie Brown. Now with live video chatting, Snapcash, My Stories, drawings, Our Stories, Filters, Friends, Geofilters, and of course the classic one to ten second photo and video messages that disappear after watched – the Snapchat universe is bigger than ever. Chances are you have the app as a personal account, but have you ever thought about creating a Snapchat account for your business for marketing or advertising purposes? If you haven’t, you should. According to a blog written by digitalrelevance, Snapchat is the preferred social channel for consumers aged 13 to 25 and there are more than 30 million Snapchat users with roughly 16.5 million of them are active daily. The blog also stated that 77% of college students use Snapchat daily, and 73% of that number claimed they would open a snap from a brand that they are familiar with. This opens the door for exponential growth of brand exposure, especially if the target audience of your company lies within the Millennial generation. This blog will explore three ways for your company to market and advertise using the ever increasingly popular app- through Snapchat Ads, Snapchat Live, and continuous participation in My Story’s as a company. On October 17, 2014, Snapchat announced on its blog that it would be placing an advertisement in the “Recent Updates” section of the app with a ‘sponsored’ tag the following weekend. The company validated their decision by stating that they “needed to make money to continue to surprise the Snapchat community with more terrific products.” The company encouraged users to keep an open mind about the advertisements claiming that they would try to deliver a “fun and informative advertisement experience the way ads used to be before they got creepy and targeted.” The ads would act like the My Story feature allowing users to watch it if they wanted within the 24 hour time period before it disappeared. 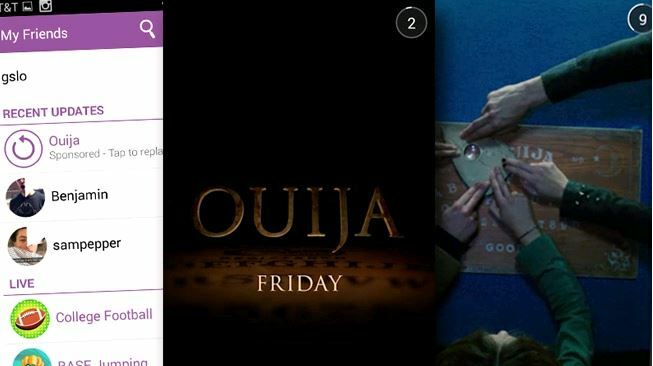 That weekend the first Snapchat ad ran for the upcoming release of NBC Universal’s horror film “Ouija,” a movie targeted towards young adults. The ad was a 19 second “mini-trailer” promoting the movie, and users had the option to watch it or not. And they watched it by the millions. Check out some of the responses here. This was the first form of Snapchat advertising now known as a “Brand Story.” According to a recent Yahoo Finance Article, initial advertisements werecampaigns for time sensitive events (movie premieres, video game releases, etc.). To advertise on Snapchat, select brands and businesses are asked to develop video content for the platform and then spend money to promote said content. But don’t expect to get involved for cheap- advertising spots on Snapchat are currently selling for up to one million dollars for select companies invited to test out the waters. Don’t have the resources to pay the hefty price for a Snapchat ad? There are still other ways for your business to get involved. Since the first ad ran in October, Snapchat has created another advertising opportunity for businesses known as “Our Stories.” Our Story allows Snapchatters who are at the same event to seperately contribute snaps to the same Story. The app uses geo-centric location services to aggregate a “live” Story for users everywhere to watch. When the app detects a user is at an event through the location services provided by a smartphone, they have the option of sending their Snapchat to the “Our ____ Story” event. From there, it may be published and viewable to anyone. “Our Stories” are featured in the “Live” section under My Stories and offers a multi-perspective view of trending events. As a business you can potentially get involved by attending popular events that have “Our Stories” and posting content to the Story while crossing your fingers and hoping that you get featured. However, the better thing to do is try and snag a “brought to you by” advertising spot that places a 5-10 second video or photo ad from a company into the live stories. This feature is only offered to select companies at this time, similar to Snapchat Brand Stories. Invite users to see behind the scenes/ previews – Give users a secret inside look into your company that they can’t access anywhere else. Victoria’s Secret did an excellent job of this during their VS Fashion Show 2014 by interviewing the Angels, showing run-throughs, backstage, and set up of the event. The company continues to excel on Snapchat by previewing summer looks and giving their friends an inside look as to what they can expect from the company! The main trick when it comes to this method of marketing is providing entertaining content that will appeal to the Millennial audience. Take advantage of UGC – Allow users to interact with you by inviting them to Snap themselves wearing/using your products to your account for an opportunity to be featured on other social media campaigns created by your brand. UGC is becoming increasingly important in social media campaigns, as well as hyper-personalized marketing. Expect some spam from users, but also be sure to screenshot the good ones! 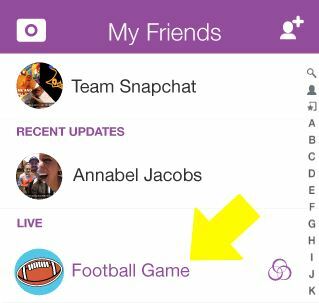 Post live, relevant, trending content in a timely matter– Newsworthy events happen on a daily basis, and as a brand Snapchat is a great channel to post immediate reactions to relevant or important events. Be sure to make them entertaining, PC, and fun for users to enjoy. This backs up the importance of current events- even if you’re a day late it is too late for Snapchat. Don’t miss out on potential opportunity. Host games/contests– Incentivize users to follow you! Offer regular contests and giveaways like Chat Sports (seller of sporting event tickets) by posting to Snappers asking them to snap you back for a chance to win, the first 5 to snap back will win, or other ideas similar to the sort. It is important to post other content as well, but by having regular contests, users are more likely to continue following your brand and you have more leeway to push more semi-promotional content (still following Snapchat courtesy of course). Tell a story– Snapchat is a relationship building social application. Like other digital tools, the future of Snapchat is moving towards storytelling. Use Snapchat to experiment with your businesses advertising and marketing efforts. Be personable. Be creative. Intrigue users with interesting stories that are different than anything else offered by competitors. Other Tips: Promote your Snapchat account on other social accounts to raise awareness, be more like a person and less “branded”, take advantage of the medium (post what users will want to see or risk being ignored), and don’t create an account unless you are prepared to create social campaigns just like any other social channel! 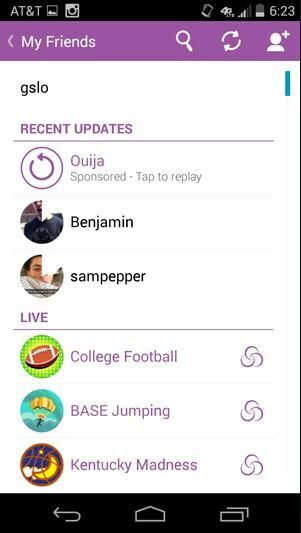 Stay tuned as Snapchat ads continue to develop for more marketing possibilities!